Square Root of a Sonnet, which has had hugely successful runs since it opened back in 2016, will return to the Bengaluru stage this weekend. The story of Subarahmanyam Chandrashekhar is, as Choudhury puts it, "one of the most unusual and remarkable controversies in the history of modern science." "Pick a flower on earth and you move the farthest star," said astrophysicist Paul Dirac. The idea that the simplest principles can lie behind the universe's most complex constructions fascinated playwright Nilanjan Choudhury no end. It sent him on a journey through the life of Subrahmanyam Chandrasekhar, a colossus of modern-day science, known in equal measure for the calculation of the Chandra Limit as he is for the controversy that dogged him for the better part of his life. 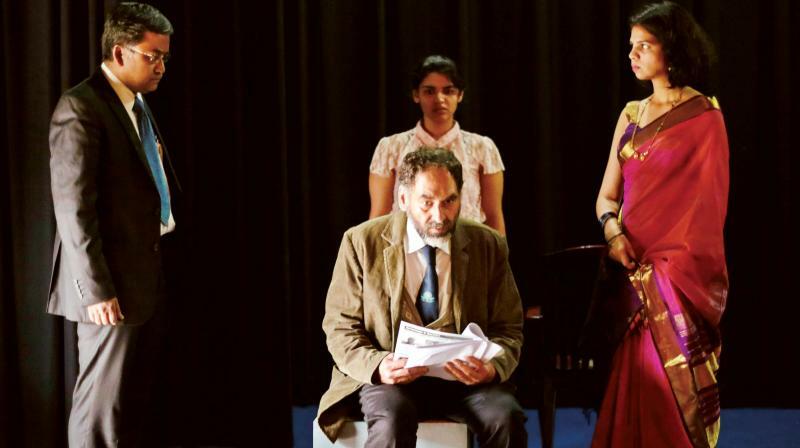 Directed by Prakash Belawadi, The Square Root of a Sonnet, which has had hugely successful runs since it opened back in 2016, will return to the Bengaluru stage this weekend. In 1983, Subrahmanyan Chandrasekhar, or Chandra, won the Nobel Prize for Physics for his contributions to the structure and evolution of stars. Two decades later, with humanity well ensconsed in the age of information, Choudhury went about asking students what they knew about one of India's greatest scientists. Scarcely a handful could recognise the name. The popularity of Choudhury's The Square Root of a Sonnet is is a pleasant realisation, then, packed though is with scientific terminology and complex concepts, none of which the playwright has attemmpted to simplify in favour of a layman audience. The story of Subarahmanyam Chandrashekhar is, as Choudhury puts it, "one of the most unusual and remarkable controversies in the history of modern science." Chandra was still a teenager when he began to work on mathematical theories of Einstein's theories of relativity and in the course of his calculations, concluded that stars that over 1.44 times the mass of the sun collapse into themselves, forming black holes. This was the Chandrasekhar limit, the discovery that would revolutionise modern day physics. Even so, it was ignored for decades, as an unwitting Chandra found himself at the mercy of a limiting, oppressive system. Sir Arthur Eddington, a legendary physicist, took a keen interest in Chandra's work. "He had worked closely with Einstein and was one of the few members of the scientific community who spoke out in support of him at the end of World War 1," says Choudhury. "He arranged Chandra a meeting with the Royal Astronomical Society, one that the young Chandra went to brimming with hope and optimism." He was cut down and humiliated - Eddington did everything he could to suppress Chandra's work - even referring it as "stellar buffoonery" at a talk in Harvard. This may have set the field back by a few decades, for Chandra was forced to shift his area of study until Eddington's death in 1944. Stunningly, Chandra had nothing but admiration for his mentor, a stance he maintained throughout his life. "It was a very strange relationship - he spoke glowingly of Eddington even in his Nobel Prize acceptance speech," says Choudhury. In the play, they seek to examine the possible reasons why this might have happened, from the points of view of both Chandra and Eddington. "we leave the viewer to come to their conclusion." To Choudhury, the IT man and self-professed science afficionado, The Square Root of a Sonnet is his attempt at communicting the science of nature. "We depend on the great geniuses to show us the workings of the world and when that happens, you're awed by the simplicity behind the most complex things," he says. "These are people who worked essentially with pen, paper, blackboards and their imagination, as well the belief that there is an inherent order amongst the chaos we see."